Monday – Saturday: 11:30 a.m. – 4:00 p.m.
Sunday – Thursday: 4:00 p.m. – 10:00 p.m.
Sunday – Wednesday: 8:30 p.m.
Thursday – Saturday: 9:00 p.m.
Tickets usually range between $20.00 and $50.00 per person. You can catch acts as diverse as the Mega-Legend James Brown or go to the other side of the musical spectrum and catch Anthrax. 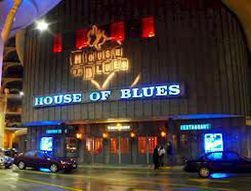 Dining at the House of Blues Restaurant, just downstairs from the stage, will make your mouth water - Cajun style. For dinner, choose the Pan Seared Voodoo Shrimp with rosemary cornbread and Dixie Beer reduction. At $10.95 it is truly a religious experience. Then ask for a Brick Oven Roasted Pizza, or New Orleans Style Chicken Gumbo with Andouille sausage and okra in a traditional brown roux - for $4.50 a bowl, this is outstanding. Top off the meal with a memorable piece of Florida Key Lime Pie with raspberry sauce for $6.50. The Sunday Morning Gospel Brunch is a great tradition as well. Musicians perform while you enjoy a delicious meal surrounded by the sound of great Gospel Music.